10/3/10 – Acquisition – Caen, Musée des Beaux-Arts – A student of Annibale Carraci in Bologna before becoming his rival by creating a competing Academy, Pietro Faccini was a prolific draughtsman, with an easily recognizable style, but a rare painter ; there are only about forty known canvases by him. The magnificent painting acquired by Caen from a private owner in Paris is therefore an important purchase for one of the most active museums in the field of old masters. 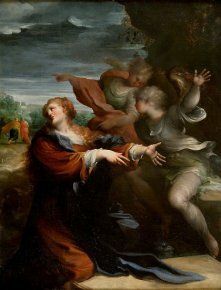 Faccini, who died at the beginning of the 17th century was one of those artists who, like the Carracis but also like Barocci (with whom he shows many similarities), Cigoli and some others prefigures, in the late 16th century, the style of the 17th by blending a certain Classicism to a Mannerism which was dying off. His art was also influenced by Correggio and by Venetian painting. The work acquired by Caen represents Mary Magdalene at Christ’s Tomb when she discovers it is empty. Two angels also show their astonishment. There is an obvious elegance and extreme refinement in the colours as well as the composition, evident also in the expression of the three figures. The painting joins an already rich collection of Italian art at Caen, one of its strong points. Visitors to the museum will be able to enjoy the painting starting 11 March. The frame has been donated by the Société des Amis of the museum.